The truth of it is that wholesome cooking techniques need to satisfy merely THREE basic and simple standards the food you eat should not have surplus amount of fat and sea salt i.e. should not be an excellent source of calories, it should retain the nutrients i.e. it shouldn\’t be empty calories and above all, it should taste good. Linda & Carolyn great post and article. Though I thoroughly understand and appreciate our need for bees, my fear of them outweighs all else! I’m glad we have a caring soul in Linda who will help take care of our important critters. Sounds like from the posts, you’ve gotten a few more interested in bee keeping as well. Good job! Me, however, I’ll do my part by….eating the honey : ) Thanks for the story and post girls! Though I thoroughly understand and appreciate our necessity for bees and their complexity, my fear of them tends to outweigh all else! I found it wonderful, however, that Linda has a great connection with them. I hope we have more people willing to care for them. Sounds from the comments…there seems to be interest. I’ll do my part…I’ll help eat the honey : ) Thanks Linda for sharing. Also, thanks to Carolyn for an interesting post. Such an interesting article. I had no idea that the plant- pollinator relationship was 100,000 years old! We always try to buy local honey… thanks for the great information and your enthusiasm! Great pictures and I could see the bright pollen on the bee’s back leg. Thanks for pointing it out. cool. Let’s hear it for urban farming!! And thanks to Linda and the crew for demonstrating to viewers that a few hives of bees can make a huge difference in the productivity of one’s garden, as well as produce delicious honey, pollen, wax, propolis…and a few medicinal stings now & then! 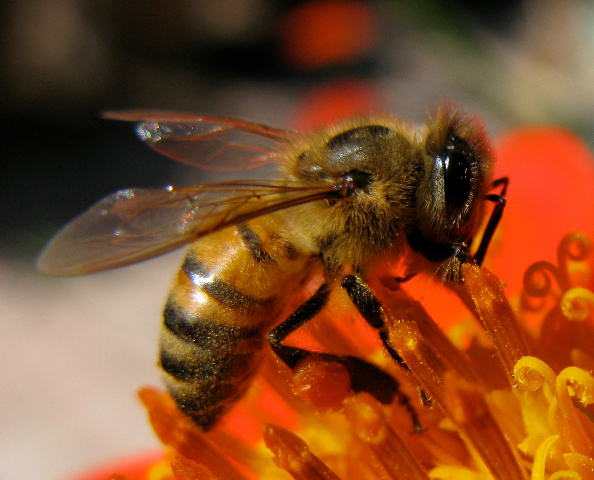 As a fellow beekeeper, I treasure her insight – that the bees are “keeping” her – so true! Let’s return the favor, and provide healthy habitat for bees in all our homes & gardens!! I just want to add that it was so much fun to work with Linda on the short video. 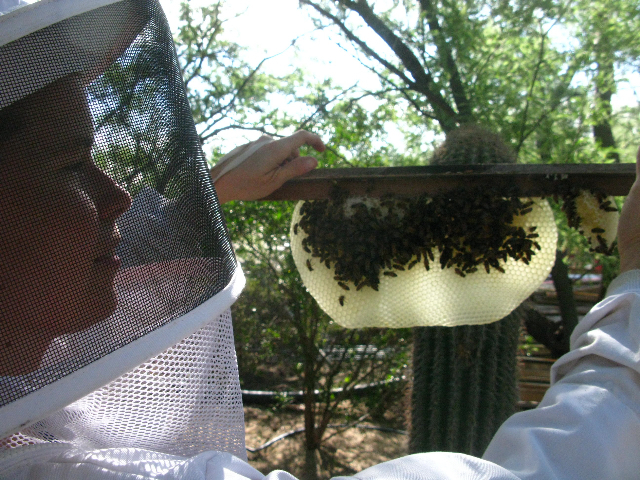 Her enthusiasm and gentleness around the hives and her evident love and respect for the bees made my work so much easier. Vanda ! You made my day. Ra’ufa! Your enthusiasm is contagious! For folks who would like to know more about creating Bee Friendly gardens (and farms!) check out Partners for Sustainable Pollination pfspbees.org! Very interesting article. I’ve been told that people should eat the honey hived in their area. More beneficial to a person’s health. By the way, loved the picures. Thanks so much for your interest! I too love the photo of the bee on the orange flower. She was foraging right outside our front door on the Mexican Sunflowers that grow there, when it is warmer. If you look closely at her back leg you can see the bright orange pollen that she has stuffed into her pollen sack. Honey bees are beautifully designed. Nice article, Linda. Do you know if different municipalities have rules for keeping bees the way some do for keeping chickens? Do you know what agency in a local government would generally be the regulator? Marilyn! Thanks for the kind words. Regarding your question: while many places in the world welcome and even revere bees and beekeeping, there are those that do not. In the US, each state has its own rules on keeping bees, chickens etc, and, sometimes within states variations exist from one municipality to the next. It is wise to check the codes in your city. You can find out what the laws are by visiting the Web site for your local city or county. On the website look for a link to “Ordinances” or “Code”. If you have trouble, you can often go to your local library and ask for a copy of the ordinances. You may also find information through the Department of Agriculture, your local zoning board, the town hall, bee clubs etc.